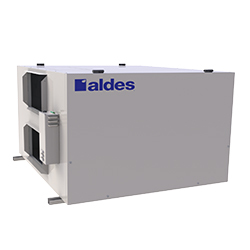 Aldes Light Commercial Heat Recovery Ventilators (HRV) provide high-efficiency heat recovery. The units use a robust, water-washable polypropylene core that can withstand a range of environmental conditions. The H1800 is powerful yet quiet enough for use in restaurants, offices, and other light commercial buildings. The H1800 is ideally suited for cold-weather applications. The H1800-Fi shuts down the fan for the outdoor air supply during defrost cycles. 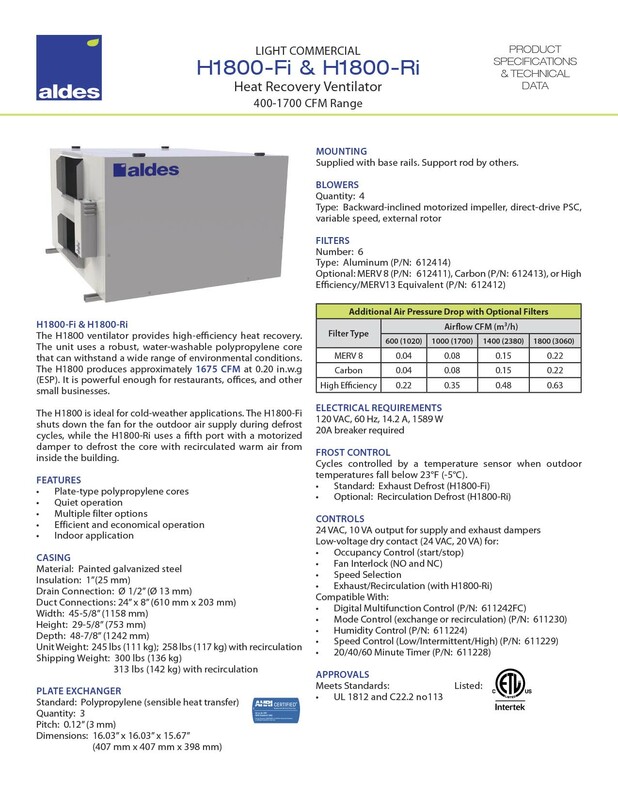 The H1800-Ri uses a fifth port with a motorized damper to defrost the core with recirculated warm air from inside the building. Other key features include: non-dust-loading backward-inclined impellers, integral mounting rails, and multiple filter options.